During my most recent assignment I had to think about role of coach and coaching. I found myself in a situation where large-scale Agile transformation was pushed forward and “coaching” was seen as a tool “to harmonize working practices” and “deploy new ways of working in teams“. I had tough times with myself and my work — to me coaching was something else than “tool to enforce people follow same practices“. Yes, coaching is something else. But what is it? How could I explain “coaching” to myself and people I work with? I like metaphors, at best they are powerful visualizations and form a basis for storytelling. They create strong emotions and connections, if chosen carefully. This time I went for an iceberg. 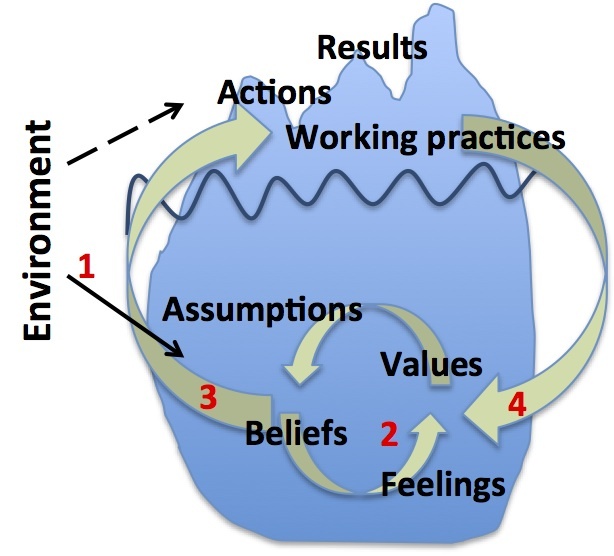 I came up with my iceberg independently and alone, and only later someone told me it looks a lot like David Rock‘s coaching iceberg. Very often the expectation for coach is visible results: “Tell me how to empower teams?” or “What should we do to improve predictability of SW development?“. Closely related to results are actions and working practices: observable things we do (differently) in order to get the results. These are the tip of the iceberg. Sticking with these is not what coach should do. In order to get the desired results and facilitate sustainable change, coach should work on the invisible (or not observable) part of work. The environment is the context or agenda. Some coaching wisdom says that coach should be completely agenda-free, i.e. have no pre-defined framework. I disagree with this; my agenda is Agile and Lean, I help people in that context (but not limited to that) and this agenda creates a framework to model and understand the situation. To my opinion, coach can do four things to improve work and get visible results. However, very few of these are directly related to daily work. First, and not the most relevant, is to provide new ideas from the environment, i.e. explain the world from Agile and Lean viewpoint. This is usually the reason for hiring external consultant: come and tell us how things are done elsewhere. Next, and more important, is to help people understand their thinking. It is helping the people to give words to their issues. Naming is important part of understanding. To me this also has a lot to do with cause-effect relations; asking “what happens if X” or “how does this action affect Y“. The most important part for me is helping people to turn thinking into action. Coach helps people to find places for experiment and facilitates the needed agreements that are required to change old working habits. Coach also helps people not to fall back to old routines and encourages when novel approach feels painful. Finally, again very important, is to help people reflect their work. This creates a link between thinking and action: “What just happened?” is good question fox quick feedback loop. Larger and slower actions may require retrospectives or other “formal” reflection. After drawing the picture I see there another pattern that makes sense from Agile and Lean perspective. 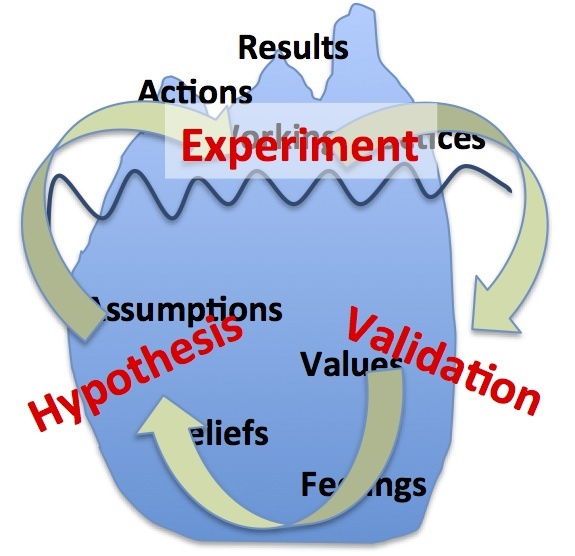 Coach helps to build Hypothesis – Experiment – Validation cycles in the organization. Giving issues names, thinking about cause-effect relations and clarifying thinking is a way to build hypothesis. Trying the hypothesis in action is experiment and reflecting the results is validation. Key to successful change is getting this cycle working: encouraging people to do small-enough changes consciously and reflecting the results together.